Lift Safe Direct has an extensive range of cylinder wall brackets and cylinder floor stands, manufactured to suit the cylinder used. Suitable for indoor and outdoor usage. Finished with a durable polymer powder coating. We also offer an in-house design service. So if you cannot see a product to meet your requirements please contact Lift Safe Directs sales and design staff, we are sure we can help. 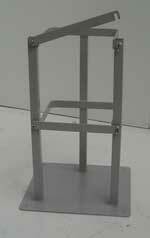 Floor stand to hold one large gas cylinder (230mm to 375mm). We can manufacture cylinder brackets or stands to suit any cylinder. 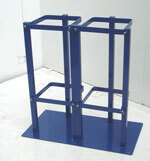 Floor stand to hold two large gas cylinder (230 mm to 375 mm) May be bolted to floor or if required left free standing. We can manufacture cylinder brackets or stands to suit any cylinder. Hinged latch stands too hold three diameter of cylinders. 180mm dia, 230mm dia and 285mm dia. 2 Hinged access latches secured by wing nuts. RSA and mild steel flat section, fully welded throughout. Heavy duty base plate and support. Base plate pre-drilled for floor fixing. Static cylinder stands too hold three different diameter cylinders. Welded steel construction with cylinder support and sheet steel base, cylinder retention chains is fitted as standard. Each unit holds two cylinders, multiple unites can be joined to each other, either side by side or back to back, to build up banks of stands for high capacity storage. Single sided cylinder stands to suit a wide range of cylinders. Single sided units have rear frames pre drilled. This product comes with an option of two or three bays depending on your requirements. Double sided cylinder stands to suit a wide range of cylinders. Double sided units have rear frames pre drilled. This product can be used on its on or with more racking to build up banks of stands. Cylinder wall brackets to suit a wide range of gas cylinders. These racks must be fixed to the wall at a height of at least two-thirds of cylinder height. It comes as standard with link retention chains and pre-drilled fixing holes for bolting to the wall. The racks can hold either two or three cylinders.